Basel Action Network (BAN) has reported on the conviction of two executives at the recycling company after the environmental watchdog uncovered evidence it had been illegally shipping e-waste to developing nations. Executive Recycling, which was based in Englewood, Colorado, was observed by BAN shipping 20 shipping containers from its loading docks, which were then tracked overseas to developing nations in Asia. BAN passed on the information it had obtained to the Environmental Protection Agency (EPA) as well as CBS News, which reported on the company in an episode of its 60 Minutes show entitled ”The Wasteland”. The program followed one of the containers to China with BAN’s Executive Director Jim Puckett, and after the broadcast, EPA’s Enforcement and Homeland Security Immigration and Customs Enforcement (ICE) indicted the recycler on 16 criminal charges in a Denver court, with Executive Recycling’s Tor Olson and Brandon Richter convicted of criminal charges for illegal export of hazardous waste, smuggling, obstruction of justice and wire and mail fraud. Richter was the former owner and CEO of the recycler, which also had locations in Utah and Nebraska, and the company has since renamed itself Techcycle. 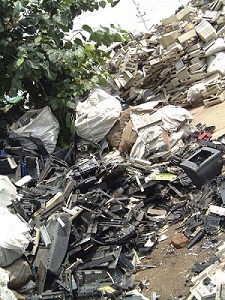 Whilst the trial suggests the endeavor was successful, Puckett noted that e-waste dumping is “still a very common practice in North America and most often companies get away with it”. Puckett added: “This conviction is very welcome, but sadly as we speak, there are many hundreds of other fake recyclers out there that are loading up Asian-bound containers full of our old toxic TVs and computers. Puckett also noted that there is not enough “clear and strict legislation” to punish companies such as Executive Recycling, adding that this case was “very difficult” for the US government to try as “they were forced to make their case using fraud, smuggling and other charges” because environmental export laws in the United States are currently “vague and ineffective” in comparison to many other nations.